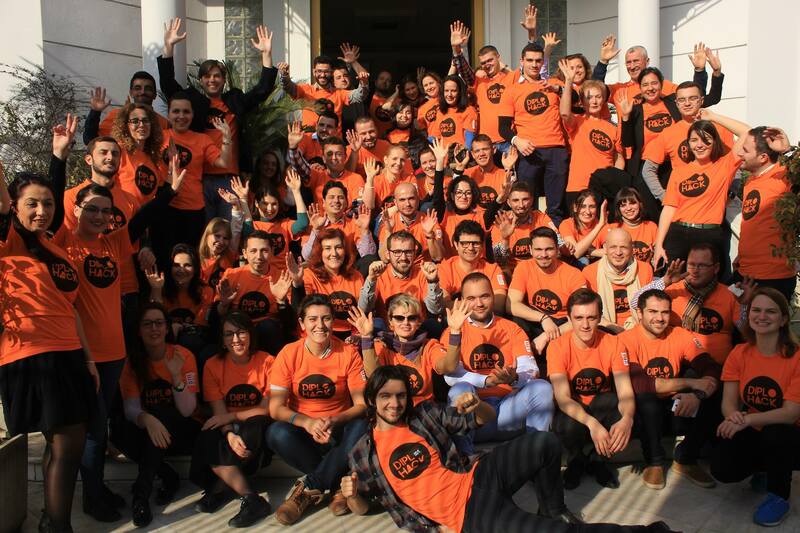 A blog by Nori Spauwen, intern at the embassy of the Kingdom of the Netherlands in Albania. The embassy of the Kingdom of the Netherlands in Albania organized a DiploHack in the light of our Dutch EU presidency. The theme of the hackathon, that was the first of a series organised by Dutch embassies in the run-up to the TransparencyCamp Europe Unconference in June in Amsterdam, was “Giving Civil Society a Voice: Using Open Data to strengthen civil society advocacy”. 55 participants from diverse backgrounds, all of them civil society members, diplomats, or programmers came together for a weekend to develop concrete solutions for pressing problems for Albanian citizens. An energetic group of diplomats, programmers and civil society came up with many ideas for innovative ways government and civil society can better communicate with each other in Albania, making use of open data. Strengthening civil society, and asking government institutions to work in a more transparent manner is important in this EU candidate member state. The Netherlands, currently holding the EU presidency, is focussing on innovation, civil society and transparency during its presidency term. DiploHack Tirana was organised together with the experienced NGO Albanian Institute for Science (AIS). The event took place in the offices of the Dutch embassy. For many of the participants it was their first time in an embassy building. The team that used the ambassador’s office enjoyed posting selfies sitting in the ambassador’s chair on Facebook and Twitter. At the end of the day, each of the 13 teams presented an original and feasible plan to the jury (check out the ideas here). They used prototype-apps and well-designed websites to support their pitch. Ideas varied from creating and sharing info on bike lanes in Tirana, a thematic overview of NGOs in the country, an app showing you which job will pay you best and a website providing tools to ask questions to your parliamentarian. AIS has already started with one of the ideas, making information on new procurements easily accessible online. The winning team was taken by surprise: “I am really shocked that we won, there were so many good ideas. We are certainly going to implement AccessHack now that we won the DiploHack Tirana Award,” said Suela Lala who is an activist working to improve the rights of people with disabilities. The team is also looking forward to participate in the TransparencyCamp Europe Unconference in Amsterdam later this year, which is part of their prize. The team was made up of civil society representatives, diplomats and a programmer. Programmer Ergest Nako: For me it was the first time working with civil society and diplomats and it was an amazing experience. Civil society members and diplomats enjoyed the cooperation, too. “It’s a real privilege that as a diplomat, I can actually contribute to the improved quality of life of Albanian citizens,” Masa Siftar of the Slovenian embassy said. Even for the embassy the DiploHack was extremely inspiring. It proved to be a good format to connect the Dutch priorities for the EU presidency (innovation, connections with citizens and more transparency) and bring them into practice. This DiploHack was the first in a series of DiploHacks that Dutch embassies all over Europe will organise during the Netherlands’ EU presidency. The objective is to strengthen transparency and innovation and to make more connections between governments and citizens. Winners of these DiploHacks will come together on June 1st at the TransparencyCamp Europe Unconference in Amsterdam. If you have missed DiploHack Tirana, do consider sending in your App for the online TransparencyCamp Europe App Competition. The best ideas will also get the opportunity to present at TransparencyCamp Europe Unconference. Wrapping up the first TransparencyCamp Europe!